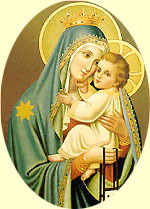 Most Holy Virgin, Beauty of Carmel, Virgin Flower, forever in bloom, Bright Ornament of Heaven, Virgin Mother of a Man God, Mother of Holy Love, Mother of mercy and meekness, Mother honoured above all mothers, be propitious to your dear children of Carmel, and to all those who have the happiness of wearing the holy scapular. O Mary, Queen Beauty of Carmel, and Gate of Heaven, to you do we sigh, to you do we cry. Bless us all, O Mary. Amen. 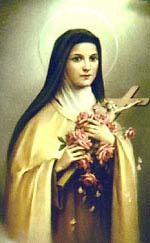 O Glorious St. Thérèse, whom Almighty God has raised up to aid and inspire the human family, I implore your miraculous intercession. You are so powerful in obtaining every need of body and spirit from the Heart of God. Holy Mother Church proclaims you "Prodigy of Miracles... the Greatest Saint of Modern Times." Now I fervently beseech you to answer my petition (mention here) and to carry out your promises of spending Heaven doing good upon earth... of letting fall from Heaven a Shower of Roses. Little Flower, give me your childlike faith, to see the Face of God in the people and experiences of my life, and to love God with full confidence. St. Thérèse, my Carmelite Sister, I will fulfill your plea "to be made known everywhere" and I will continue to lead others to Jesus through you. 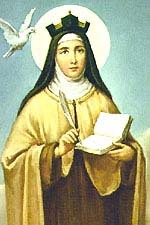 O great St.Teresa, we are lost in admiration of you. So many names, elevated and loving are yours, but one of preference we will call you by is "Teresa of Jesus" It tells best all that you were and are to Jesus and to me. You have been looking with pleasure at your children, most unworthy but loving, you have marked our endeavour to glorify you. To show you our love and confidence in you, accept what you find deserving and teach us not to cling to what is passing away. Look into our hearts. Read there our sincere desire to pray like you, to work like you and above all to love like you. Make us by the apostolic motives and spirit with which we devote ourselves to our life-work, true to our name. Remove from us all forms of tepid and unworthy living. Our Mother, our saint, our Patroness, hear us, bless us and obtain for us what we ask for the love of Jesus. Amen. Remember O most amiable, O most benevolent, O most kind, and O most merciful Father, St. Joseph, that the great St. Teresa assures us, that she never had recourse to your protection without obtaining relief. Animated with this same confidence, O dear St. Joseph, I come to you and groaning under the heavy burden of my many sins, I prostrate myself at your feet. O most compassionate Father, do not, I beseech you, reject my poor and miserable prayers but graciously hear and obtain my petitions. Amen. 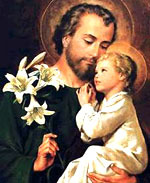 Our holy Father, St. Joseph, pray for us. God of Love and Mercy, You have poured out Your gifts of grace in abundance on Your servant, Mother Veronica. We thank You for the precious heritage she has left to the Church through her single-minded search for Your will and her heroic pursuit of holiness. We humbly ask You to grant that she may be raised to the honours of the altar, so as to be a continual source of inspiration to all who aspire to a life of close union with You, and of selfless service to others. We ask this through Christ Our Lord and the intercession of Mary, Queen and Mother of Carmel. Amen. Dear Mother Veronica, we earnestly ask you to intercede with God that ......... (mention the favour you are praying for) so that He may be glorified through you. Amen. This website is graciously hosted by The Fabian Corporation.